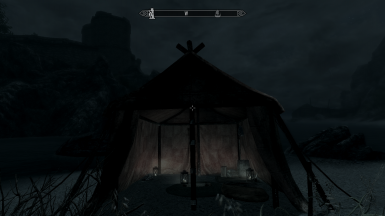 A simple patch to allow characters in SureAI's Enderal to sleep using the tents and bedrolls added by Chesko's Campfire - Complete Camping System. Added Enderal's new trees to the _Camp_Trees FormID list, which should make deadwood and branches gatherable in all appropriate areas. Minor adjustments to Campfire's weapons and armor for consistency with Enderal's equipment. Reduced the damage of the Longbow, Stone Arrow, and Stone Hatchet; reduced the armor rating of Fur Armor. Added recipes for converting Enderal's clothing into Old Linen (Linen Wraps). Fixed a potential problem with Campfire's Keen Senses perk caused by Enderal's removal of the HunterPrey Faction. Carried forward Enderal's changes to the Tamriel Worldspace record (which it repurposes as MQP01Home, "Home, Sweet Home"). Fixed an issue where Campfire's capes, backpacks, and walking stick would not appear on Half Arazealean (NordRace) and Half Qyranian (RedguardRace) characters when eqipped. 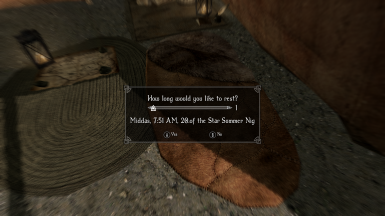 Enabled sleeping in Enderal using Campfire's bedrolls and tents. In addition, a handful of other minor fixes have been implemented in version 1.1, primarily affecting Campfire's equipment and the Keen Senses perk. Please see the change log for details. Use a mod manager or manually download the file and extract its contents into the Data folder. 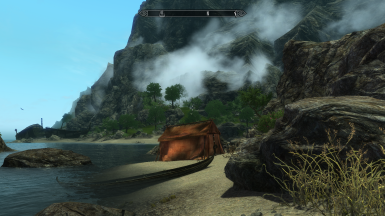 Given the extensive changes that Enderal makes to Skyrim.esm, it should be expected that certain aspects of an otherwise compatible mod may not function properly if the vanilla records they relied upon were changed. A short (and not necessarily exhaustive) list of Campfire's potential compatibility issues with Enderal follows; if possible, I may address some of these in future updates. Campfire's scripted distribution of equipment to merchants doesn't function, as none of the vanilla merchants exist in Enderal. A significant number of records integral to the vanilla "crime" system have been removed in Enderal. For this reason, I recommend disabling the "Camping Illegal in Settled Areas" option in Campfire's MCM. 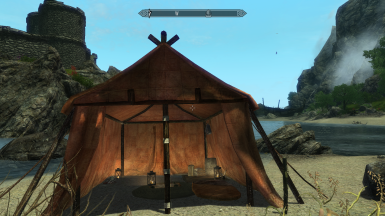 Followers won't use Campfire's tents due to Enderal's removal of the CurrentFollower Faction. As Enderal doesn't support followers though, this is currently a non-issue. Thank you to SureAI for their amazing Enderal total conversion for Skyrim. Thank you to Chesko for Campfire - Complete Camping System and all his other wonderful mods.